The difference between GREAT and MEDIOCRE Asparagus is, plainly and simply, FRESHNESS. 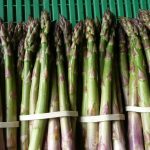 The bulk of our spears are sold directly to our customers from the Farm, with the remainder gracing the tables and shelves of a few local Restaurants and Farm Shops. We are always willing to talk about good prices for bulk – directly from the field, unwashed and ungraded as we do not have the additional labour costs. The season starts anywhere between early April ( 🙂 ) to early May ( 😥 ). This is totally temperature dependent. Temperatures of 13 degrees = growth onset; 15 degrees = some growth; 20 degrees = perfect! 24 degrees sees us really hopping about, cutting twice in a 24hr period, before the heads ‘blow’ (open!). Temperature-paranoia does really set in – even night temperatures are carefully watched. Cutting stops on Summer Solstice, 21 June. This is to allow the fern (which would have been the delectable spear you would delightfully have placed into your mouth) to photosynthesize and build a good root system which the following season will send up spears again. A truly amazing crop….. If you are one of the uninitiated: Asparagus is very easy to prepare. Simple is always the best. Just steam for just a few minutes until al dente and serve up with butter (preferably Goats’) and loads of Parmesan cheese. Eat with fingers. Butter must trickle down sides of mouth!